Sewage Backup Westchester: Should We Be Inspired By Ninja Turtles? Westchester NY » Blog » Sewage Backup » Sewage Backup Westchester: Should We Be Inspired By Ninja Turtles? Most of us have grown up watching the Ninja Turtles cartoon and for those of you who haven’t, have probably seen the movies. Those green creatures may seem like heroes but think about all the bacteria they are bringing up from the sewers. Our Sewage Backup Westchester team can tell you why you should get your mind out of the gutter and body out of the sewer. What Exactly is in that Sewage? 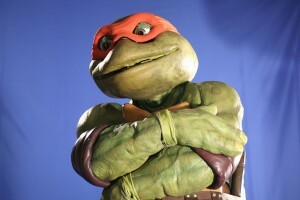 Raphael won’t tell you what disgusting bacteria are in the sewage, rather he’ll wave around slice of pizza and karate chop you in the face. Think about what is lingering on his hand and greasy pizza. Sewage is contaminated with viruses and E Coli that can be seriously harmful to you and your loved ones. Not to mention, skin infections are one of the largest effects of coming in contact with sewage. Maybe this is how they became turtles? It’s tough to say. The worst part is when sewage seeps into your home; your hardwood can contain a foul odor which is difficult to remove. Our Sewage Backup Westchester experts will gladly kick out the turtles and the sewage they’re bringing in. Forget Pizza Time and get ready for Sewage Backup Time. When you experience sewage backup, vacate the area immediately. Do not try to take care of the situation yourself because you can get infected or contaminate others. Cross contamination is a serious issue that should be addressed and solving the issues yourself will cause more problems. Feel free to depend on our Sewage Backup Westchester professionals to come in and save the day. We are a dependable company with the latest technology to prevent any type of contamination. Just because Leonardo is doing back flips across your front lawn does not necessarily make him an idol. However, our Sewage Backup Westchester professionals have all the resources to act as your heroes. We have extensive training and are fully licensed so we can complete all the necessary sewer repair and removal you need. Have the Ninja Turtles ever shown any documented evidence of their karate skills? Go with a group you can trust. Those big shells can’t fit into crawl spaces but you better believe our team will get in there and restore every inch of your home that has be jeopardized by black water.